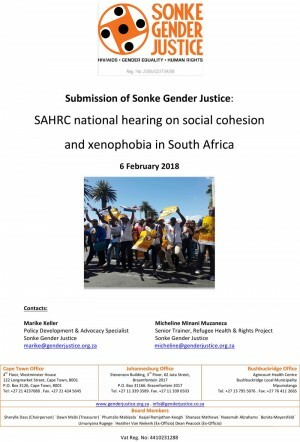 The South African Human Rights Commission’s (SAHRC) two-day national investigative hearings on migration, xenophobia and social cohesion held on 7 and 8 February 2018 calls on relevant government departments, regulatory bodies, civil society organisations, researchers, academics, media entities, and social commentators to contribute towards awareness-raising on issues pertaining to social inclusion of migrant communities in the country. The role of state departments will be assessed through the national hearing, to inform both the SAHRC and the general public on the complexities of addressing migrant-related discrimination and achievement of social cohesion. Sonke Gender Justice presented on our community and policy work related to refugee health and rights.